A new Canadian company accounts for half the purchases of conflict minerals from occupied Western Sahara. WSRW calls on investors to immediately blacklist the new company for breach of basic ethics. This week marked the formal and final establishment of a new Canadian company, Nutrien, based on the merger of two highly controversial fertilizer companies, Agrium and PotashCorp. The two latter have over the course of the last years been blacklisted by several dozens public and private investors globally for contributing to Morocco's violation of international law in Western Sahara. Morocco has occupied the territory and is illegally selling the conflict rock to clients overseas. WSRW’s work is being read and used more than ever. But our financial situation is tough. Our work takes time, dedication and diligence. But we do it because we believe it matters – and we hope you do to. If everyone who reads our website or likes us on Facebook, would contribute to our work – 3€, 5€, 27€ … what you can spare – the future of WSRW would be much more secure. You can donate to WSRW in less than a minute here. PotashCorp has been importing from the territory for decades. Agrium only came into the picture in 2013, after signing a long-term purchase agreement with the Moroccan state owned company OCP. Among the investors blacklisting, are the government funds of Norway and Sweden. WSRW expects that all investors who had already blacklisted one or both of the firms, will automatically apply the exclusion decision to the newly merged entity in the coming months. Western Sahara Resource Watch has been monitoring vessel movements in the territory on a daily basis since 2011. The research has been published in annual reports (published for the years 2012-2013, 2014, 2015, 2016). According to WSRW's calculations, during the period from 1 January 2013 to 31 December 2017, Agrium and PotashCorp took in 75 of the 186 vessels carrying phosphate rock from the territory. These 75 vessels contained 4,54 million tonnes of rock, out of a total exported volume of 9,15 million tonnes. In recent months, several investment firms have relinquished their interests in companies that are involved in the natural resource exploitation of occupied Western Sahara. Here are 21 of them. In other words, Agrium and PotashCorp account for 49,5 percent of the total trade. WSRW calculates the value to be 526 million dollars, out of a total export during the period of 1,079 billion dollars. By far, the new company Nutrien is the biggest funder of the brutal and illegal occupation of the territory. "Investors should take note of the numbers and the risk. From 2013 until today, Nutrien has paid half a billion dollars to the Moroccan government for non-renewable minerals that never belonged to Morocco. The Saharawi people have increasingly resorted to legal steps to defend their rights over their resources. Half a billion dollars have not been paid to the owners of the purchased rock - and that's only since 2013. The Saharawi people, living in poverty, are not particularly content with Agrium's and PotashCorp's acquisition of their wealth through the neighbouring country of Morocco which oppresses them", Sylvia Valentin, chair of Western Sahara Resource Watch stated. "Investors must engage with Nutrien to make it stop the purchases of the blood phosphate, or disassociate itself with this company", Valentin stated. 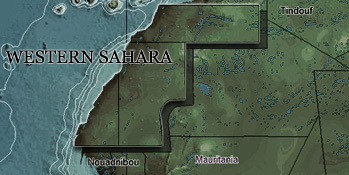 The Court of Justice of the EU on 21 December 2016 ruled that Morocco cannot sign trade deals covering Western Sahara as the territory is separate and distinct from Morocco. On 1 May 2017, a vessel carrying phosphate rock was detained in South Africa for transporting such rock to New Zealand. That vessel is today still detained, 251 days later. For the year 2017, WSRW's temporary calculations indicate that Agrium and PotashCorp received in total 911.000 tonnes of phosphates out of the 1,59 million tonnes exported, or a total of 57% of the rock exported from the occupied territory. 14 of the 27 vessels transporting phosphates from Western Sahara in 2017 ended up in Agrium or PotashCorp. The latest vessel is Ultra Saskatchewan, which is estimated to arrive at Vancouver harbour on 26 January 2018, with 59.000 tonnes of phosphate rock. The vessel departed occupied Western Sahara early December 2017 and is on its way around Cape Horn. No vessels have passed through the Panama Canal after an Agrium-bound vessel was detained in Panama for containing such rock on 17 May 2017. That court case has not yet been finalised. The latest vessel to PotashCorp arrived in Geismar, Louisiana, on 23 October 2017. The need to obtain consent from the people of Western Sahara before trading with their resources has also been stressed by the UN Human Rights Council in 2015 and 2016. Leading activists from Western Sahara were in 2017 sentenced to life-time in jail by a Moroccan court for having in 2010 demanded socio-economic rights. Half the people of Western Sahara live as refugees as a result of the occupation. The merger of the company has taken a long time to be completed. The first announcement was made in September 2016, and the process has been delayed while awaiting the approval of the competition authorities in several countries. The new company will give PotashCorp shareholders 52 percent ownership and Agrium 48 percent. There will be a combined leadership from both companies and they will have equal representation for the Board of Directors. Agrium CEO Chuck Magro will serve as Nutrien’s chief executive; PotashCorp CEO Jochen Tilk will be its executive chairman.